When I - a young journalist responsible for routinely covering cultural events - was assigned to report on China's top advisory and legislature sessions this year, a vivid picture popped in my mind: Ravenous reporters besieging delegates at the magnificent Great Hall of the People's gate, trying to scoop their proposals and skim off informative hard news. "Busy and serious" were two words that came to mind when I thought of the two sessions. I figured the currently bleak economic situation would amplify these characteristics. Premier Wen Jiabao stressed confidence was crucial during the downturn. I regarded this to mean we should be optimistic about the future and need joy more than worry. So while my colleagues were hunting for news from decision-makers, I decided to share with readers something interesting that happened at the sessions. Last Wednesday, when an art and literature panel discussion of the Chinese People's Political Consultative Conference (CPPCC) went on break, I asked renowned director Zhang Yimou what he thought of celebrities who had changed their citizenship. Everyone knew I meant Gong Li, also a former CPPCC member who started her acting career in Zhang's films before becoming a Singaporean citizen last year. "As long as they do not break the law, that's part of their personal lives I have given up my US green card," Zhang cautiously replied after thinking for a while. The video clip of the interview spread over the Internet the next day. Was I too tabloid-esque for the country's top political meeting? Perhaps. But I was not the only one who enjoyed adding some spice to the political banquet. Last Friday afternoon, I went to a hotel in western Beijing where CPPCC members from China's Youth Federation continued their panel discussion. Young elites from all sectors of society joined the talk. Their fresh and constructive ideas ignited the regular meeting. I was quite inspired by the brisk exchange - followed by lively performances - all of which I filmed for you, my readers. "I doubt ordinary people's voices can be heard by the top leaders," said Wu Renbiao, a delegate from the Civil Aviation University of China. Li Jiaming, general secretary of the Youth Federation of Macao, said: "Media should be partly responsible for the inaccessibility." 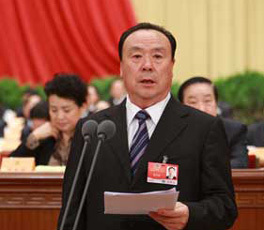 Famed CCTV host Zhu Jun asked: "Why blame media? The government should loosen some rules on media, enabling them to cover breaking news." Folk song diva Peng Liyuan said: "Art should be close to ordinary people, and the content should be close to real life." The panel then suggested members create a relaxing atmosphere during the discussion's break. Celebrated Peking Opera singer Li Shengsu performed a song that completely changed my view of the traditional art form. Next, graceful dancer Shan Chong wowed onlookers with her moves, accompanied by a vocalist from the Xinjiang autonomous region. When the break was over, the group resumed discussing the country's serious problems. The two hours designated for the dialogue had finished but nobody wanted to leave this session. I have felt quite happy and excited since attending this talk - not only for the show but also because I see a bright future for a country supported by such excellent young people.